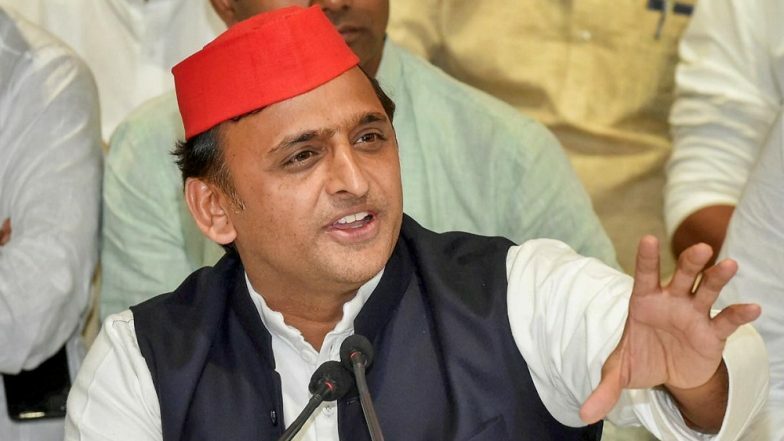 Lucknow, April 15: Samajwadi Party president Akhilesh Yadav has come out in defence of Rampur candidate and senior politician Azam Khan, who landed in row following his "khaki underpant" remarks allegedly aimed at rival BJP aspirant from the constituency, Jaya Prada. Akhilesh, who was present at the dias in Rampur from where Khan stoked the fresh controversy, said his remarks were not aimed at "another leader". He further accused the media of showing his statements out of context. Azam Khan Banned From Campaigning For 72 Hours by Election Commission For Derogatory Jibe at Jaya Prada. "We are Samajwadi people, we do not disrespect women. May be, the media is showing a manipulated and edited video," she said. While Akhilesh has defended the contentious statement, Chief Minister Yogi Adityanath has called them "shameful". "The mean and indecent remark against Jaya Prada reflects the mean mindset and personality of Azam Khan," the Uttar Pradesh chief minister said in tweet. "The silence of Akhilesh Yadav over it is shameful indeed," said Adityanath. "And the silence of Mayawati, despite her being a woman, indicates that for the sake of power, they are ready to do and put up with anything," he added. "The common perception that the people have about the Samajwadi Party has been reiterated once again. An example in this regard has been presented by Azam Khan," Adityanath earlier told a TV news channel, dubbing Khan as a man of "mean mindset and personality" for making the "indecent" remark. Without naming the actor, who is fighting on a BJP ticket from Rampur, Khan had told the gathering in an election there on Sunday, "... you got represented (by her) for 10 years. (aapne das saal apna pratinidhitwa karwaya)". "People of Rampur, people of Uttar Pradesh and people of India, it took you 17 years to understand her reality. But, I could recognize it in 17 days that she wears a khaki underwear. (Rampur waalo, Uttar Pradesh waalo, Hindustan waalo, usski asliyat samajhne mein aapko 17 baras lag gaye. Main 17 dinon mein pehchaan gaya ki inke neeche kaa jo underwear hai, woh khaki rang kaa hai)," said Khan.